healthier. The most popular New Year’s goal, though, is increasing our exercise. Exercising—whether that be at the gym, a yoga class, a swim, or another favorite activity—improves circulation throughout our bodies and detoxifies our skin when we sweat. This causes that euphoric feeling after you workout when you push your body to new limits and gives you that healthy post-exercise glow. As important as exercising is, it’s also important to take care of our skin properly before and after a workout. Workout early in the morning. Changing your morning routine to get up earlier can be beneficial to both your skin and your mind. People who wake up earlier and have a consistent morning routine experience a more productive day and decreased stress levels. Your skin can benefit from a quick wash with a gentle cleanser first thing in the morning. Starting your workout with a completely fresh face causes less irritation and gives you that early morning glow. Just be sure to use a facial wipe to remove any sweat immediately after a workout to keep those pores nice and clean! Always remove makeup before a workout. Not a morning person? No problem. Many people choose not to work out in the morning, because they really value that nice, hot cup of coffee and a little extra sleep time. A post-work exercise routine works just as well as any morning one, but it’s important to prep your skin before your workout. Once you get to the gym, clean your face using a makeup wipe or a gentle cleanser to remove any makeup or environmental toxins—which can clog your pores. We all want to look good while working out, but not at the expense of our skin. Gently wash your hands and face after a workout. If you exercise at a gym, Pilates class, or yoga studio—remember that the equipment is in constant use throughout the day. So, try to keep your hands off your face as you exercise, wash your hands following your workout, and then use a gentle cleanser on your face to rinse away sweat and toxins. Take warm, not hot, showers. Make sure to use warm (not hot) water on your face and body in the shower. Hot water can strip away natural oils and lead to dehydrated skin—especially after you sweat. After your shower, pat—don’t rub—your face dry so you don’t remove all the moisture. Remember to follow cleansing with a toner, like YOUTH® Perfecting Skin Toner, to further exfoliate, hydrate, and nourish your skin. After cleansing and toning, replace those lost oils with a hydrating serum like YOUTH® Moisture Activating Serum. 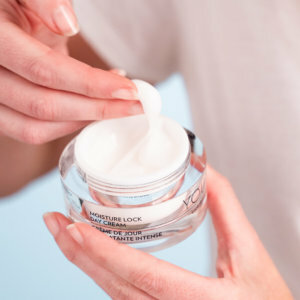 For plumper, softer, and more hydrated skin, finish with a YOUTH® Moisture Lock Day Cream. Drink enough water. This one is kind of a no-brainer, but it’s good to be reminded of it. Always stay hydrated throughout the day—especially if you know you’ll be sweating a lot during your evening workout. If you’re a morning workout person, drink at least one glass of water before you begin exercising. It’s also important to drink water after your workout to re-hydrate. You could even try using our Low-Calorie Electrolyte Drink for that extra boost of hydration. By staying hydrated, your skin will thank you all year round—no matter what exercise you do! These are just a few tips for your 2019 workout goals. Exercising is great for the health of your skin—just be sure to have a good pre and post-workout skin care regimen that works for you.